Lake Gibson Middle School FFA members and Pre-Academy Agriscience students, Blair Buchanon and Katie Harwell, worked on a yearlong investigative project studying the effects of various organic fertilizers on vegetables. The members worked together, using common household products—banana peels, coffee grounds, and fish emulsion—to see if healthy, production crops could be grown. The overall goal of the project was to find an alternative to commercial fertilizers, reducing non-point pollution from fertilizer runoff. The experiment was a huge success and the young ladies were named the State FFA Champions in the Plant Science Division of the Florida FFA Agriscience Fair. This win affords Blair and Katie the opportunity to compete at the National FFA Science Fair in Louisville, Kentucky in October. These ladies are the only middle school students who are advancing to the National Contest in the middle school division from Polk County. Kathleen FFA member, Kevin Benitez, was recently named a National FFA Proficiency Finalist in the area of Specialty Animal Production. The FFA Agricultural Proficiency Awards program recognizes outstanding student achievement in agribusiness gained through establishment of a new business, working for an existing company, performing research or otherwise gaining hands-on career experiences. Kevin works for a local Aquaculture farm, where he started employment as a general helper. Over the past two years, Kevin has gained numerous skills that have made him a valuable asset to the farm. Kevin won the State Proficiency Award in his category and was named a national finalist. Kevin will present his proficiency at the National Convention where he will compete against three other finalists for the opportunity to win scholarship prizes. Parliamentary procedure is something that is normally associated with town hall or school board meetings; however, students in the Kathleen FFA chapter have gained a working knowledge of parliamentary laws. The six person team, Morgan Carlton, Michael Gary, Lexi Sanchez, Taeler Dupre, Jamie Garner and Thomas Farris, demonstrated these skills in a mock meeting at the Florida FFA Convention and won the State FFA Parliamentary Procedure Career Development Event (CDE). In addition to the demonstration, students are required to take a written exam and answer oral questions about the presentation. 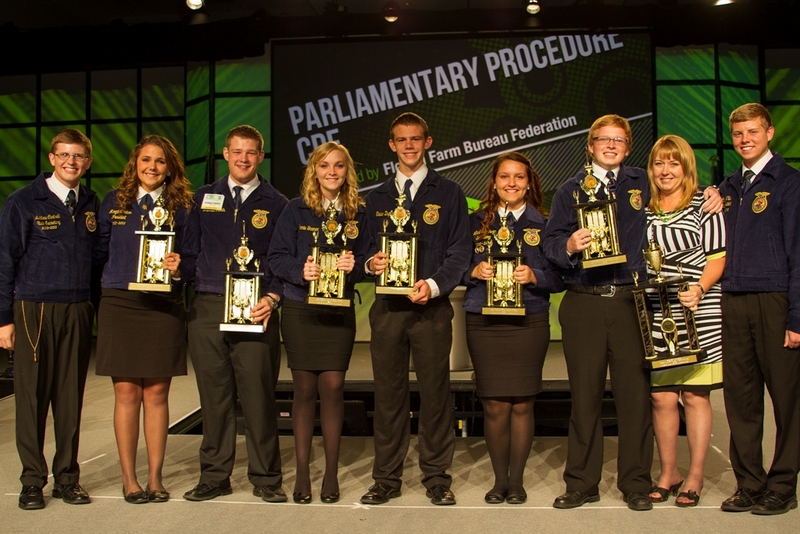 The team will represent Florida at the National CDE in Louisville this October. Kathleen Sr. FFA was also recognized for their accomplishments as a chapter. FFA chapters are ranked on the national level on a star system, with a three star award being the highest. Kathleen FFA received a three star award for the third consecutive year. Additionally, the chapter was selected as a National Models of Innovation finalist for their involvement within the community. As a National Models of Excellence finalist, Kathleen FFA is considered one of the top ten FFA chapters in the nation. Members will present their chapter’s activities to a panel of judges at the National FFA Convention, where they will be competing to earn top honors. Lakeland area agriculture students have risen to the challenge to prove that agricultural leadership can be challenging and well as rewarding. These students have learned skill sets that will serve them for years to come. Through the assistance of the Career Academies, Workforce Education and FFA in Polk County, our next generation will be prepared to meet whatever challenges await them.